"I don't want to be their equals. I don't want them to look us in the eye. I want them to look away, to blink harshly, like they've stared at the sun itself. I don't want them standing across from us. This book. Oh, wow, THIS BOOK. Prior to reading the advanced reading copy, I'd heard some promising things about this story. People described it as having 'Six of Crows' vibes, which is another series I absolutely adore. However, the comparison sells this story short in my opinion. Yes, there are some similarities, but The Gilded Wolves definitely manages to set itself apart from other heist series. This is the second book by Roshani Choskhi I've read, (The Star-Touched Queen being the first), but this solidified my love for her writing. This book was all sorts of magical, unique and beautiful, wrapped within an insanely diverse and action-packed story! Also, before you continue to read, since the book releases in 2019, this will be a spoiler-free review, so don't worry! Chokshi's newest masterpiece The Gilded Wolves centers around Séverin, heir to the fallen house of Montagnet-Alerie, current hotel-owner and part-time gang leader. He teams up with 5 allies: his brother in all but blood, botanical genius, pet-spider owner, and the definition of 'cinnamon roll,' Tristan. Then there's the Spanish-Filipino pretty boy, bisexual legend and historian, Enrique. The autistic, Polish-Jewish mathematician Zofia, who's also happens to be a huge overthinker. There's the super extra, very friendly, a little shady at times, but a gay icon nonetheless, Hypnos. And last but not least, my personal favorite, Indian performer, 100% kickass female and part-time baker, slash full-time angel, Laila. The book itself takes place in historical Paris, and the main focus is a heist plot (but with loads of mythical and religious nods) set within a world of forging (the reshaping of objects but also seeing into its existence). In order to reclaim his lost inheritance, Séverin and his crew must find a magical artifact, and all sorts of awesome things ensue! What did I think about The Gilded Wolves? This book has everything. EVERY-THING. It is diverse, action-packed, character-driven (which I adore) and filled to the brim with mythological, religious, and historical nods. The first thing I want to address is Roshani's writing. The writing is gorgeous, seriously, absolutely fantastic. The world is intricately build, and she uses tons of beautiful descriptions to explain things like alchemy and forging. However, where other books that need a lot of world-building tend to take up half the book, I found this wasn't the case in The Gilded Wolves. Despite the many elaborate descriptions, I found the pacing in this book to be absolutely perfect. As soon as you open the book you jump straight into the action, which is something I love to read, but it wasn't confusing in any way. You learn that these characters all have a history together, which only adds to the appeal of their relationships. "Everywhere he looked, he was surrounded by gilded wolves. And for whatever reason, it made him feel perfectly at home. Wolves were everywhere. In politics, on thrones, in beds. They cut their teeth on history and grew fat on war. Not that Séverin was complaining. It was just that, like other wolves, he wanted his share." Plot-wise, the story was intense overall. The heist-plot in itself is a trope that is an automatic pull for me when it concerns books. I loved the atmosphere in which it was set; high-society Europe with its historical nods and mythical artefacts paints a very aesthetically pleasing picture. The book is filled to the brim with action, and there is a plot-twist at the end of the novel that I can honestly say I didn't see coming at all. Character wise, the diverse cast Roshani introduces is absolutely amazing. Each and every character manages to worm its way into your heart by the end of the book, and there wasn't a single character I didn't like. And yes, there is romance (love-triangles (the non-annoying kind! ), LGBTQ+ relationships, angst) but romance by no means is the focus. 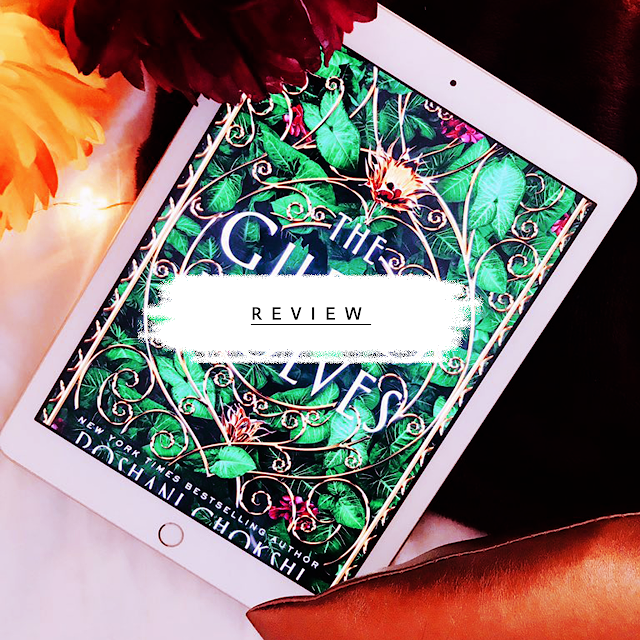 The book is very character-driven, each of them having their own motivations and backstories, that come together to form the found-family trope that I adore in the YA genre. To conclude, I thought this book was a super strong start to a series that I undoubtedly will enjoy. I think, but don't quote me on that, that this is the first book in a trilogy? Where most first books tend to take a lot of time with world-building and introducing the plot, this one jumped straight to action and introduces its characters along the way. The comparisons to Six Of Crows and other heist stories absolutely sell this book short because it is a masterpiece in its own right. This is a definite five-star read for me, and I absolutely cannot wait for the sequel to this. This is a literal gem of a book and already one of my 2019 favorites!